Kate Middleton has just released her family’s official portraits of Prince Louis’ christening along with one candid photo that is sure to make everyone smile. 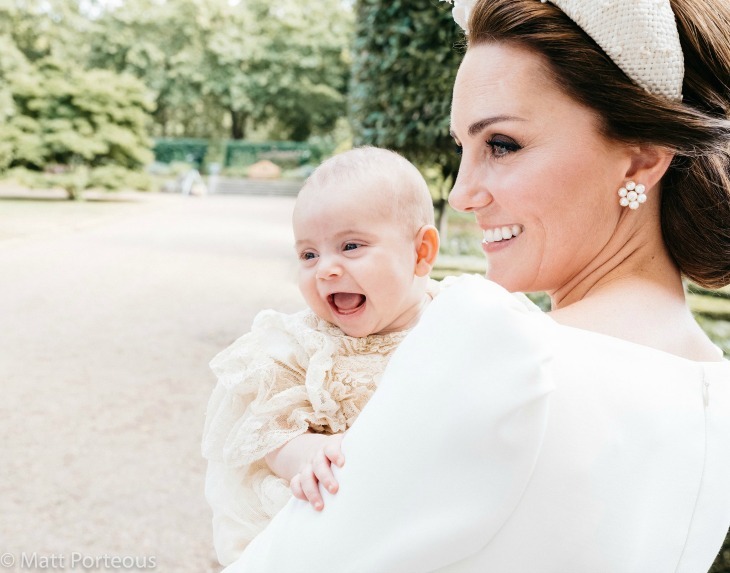 The Duchess of Cambridge, along with her husband Prince William and the rest of the British royal family, celebrated Prince Louis’ christening at Clarence House just last week. The two portrait photos included one of The Duke and Duchess of Cambridge, surrounded by their children Prince George and Princess Charlotte. Little Prince Louis is in his mother’s arms. In the second portrait, which was also taken by famed photographer Matt Holyoak, the entire immediate royal family is included. Prince William and Kate Middleton are surrounded by Prince Charles and Camilla Parker-Bowles and Prince Harry and his new wife, Meghan Markle. Even though the Duchess of Cambridge has made a few public appearances, including the recent Wimbledon tournament, she has been spending the majority of time at home on her maternity leave. Reports say that the young royal mother is expected to be back at work in her full time capacity later this year. In the meantime, let us know what you think by dropping us a line with your thoughts in our comments section below. And as always, don’t forget to check back with Celebrating the Soaps for all the latest news and updates on Kate Middleton and the entire royal family right here! What do you think of the photos? Share in the comments below!